The Pelee Island Bird Observatory is a non-profit charitable organisation devoted to the study and conservation of birds. The observatory conducts intensive migration-monitoring research and breeding bird studies on Pelee Island from April to November. PIBO’s field station at Fish Point Provincial Nature Reserve is open to the public in the spring and autumn, with educational programs provided to visiting school groups throughout the month of May. PIBO’s purpose is to collect and disseminate data that will help the international programme that is working to understand changes taking place in the populations of migratory birds. While this is our work and our responsibility, we recognize that birds exist in a wide range of cultural and imaginative contexts, as well as in specifically scientific ones. To that end we are introducing a number of satellite areas, with the hope this site will be of interest both to serious birders and to general enthusiasts alike. Long-term migration monitoring research on Pelee Island as a member of the Canadian Migration Monitoring Network (CMMN). Long-term studies of Pelee’s significant breeding bird communities. To serve as an educational centre for the public, school organisations and the community, and to promote volunteer participation in local conservation projects. To highlight the importance of Pelee Island’s unique natural heritage. Situated in the western third of Lake Erie – Pelee Island is the most southerly-inhabited landmass in Canada and the largest island in the Pelee Island archipelago (4000 ha). 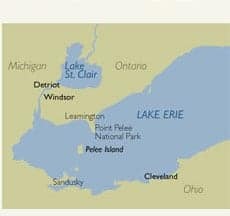 Pelee lies between Leamington, Ontario on the north shore of Lake Erie, and Sandusky, Ohio to the south. The island is located just ten kilometres southwest of the tip of Point Pelee National Park. Approximately three hundred year-round residents live on Pelee and 1200 seasonal residents and visitors call the island home during the summer months. Pelee Island is designated as an Important Bird Area (IBA) by the Canadian partners of BirdLife International – the Canadian Nature Federation and Bird Studies Canada. IBA’s are described as “truly outstanding sites of significance nationally or internationally, and sites that are exceptionally important for birds”. Visit our links section to learn more about Pelee Island’s fascinating human and natural history, as well as to find out about visiting the island, including “how to get here”, island accommodations, things to do on your visit, and other island news.